Specialised in implants (Astra and Branemark), surgery, paradontology, general dentistry and if you are afraid of the dentist. Teeth whitening, either at home or at our clinic where we use state-of-the-art equipment. Open for emergency 24Hrs. Free consultation for implants. Highly trained staff. Swedish-educated dentist. Registered and certified in Sweden, Norway and Spain. We speak English, Spanish and Swedish. 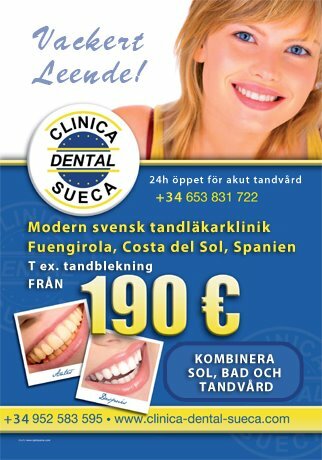 Welcome to Clínica Dental Sueca (The Swedish Clinic). For more details please see our website in English, Swedish and Spanish.